During the first year of the quad’s life our family was on lock down to protect the babies’ premature immune systems from attack. That meant we left the house primarily for doctor’s visits, and visitors to our home were required to satisfy a laundry list of requirements. After the babies turned one, we began slowly venturing out into the world. Leaving home with four babies in tow is a monumental task, therefore we preferred being home bound. Whenever we took the babies outside our home, there were always at least two adults. 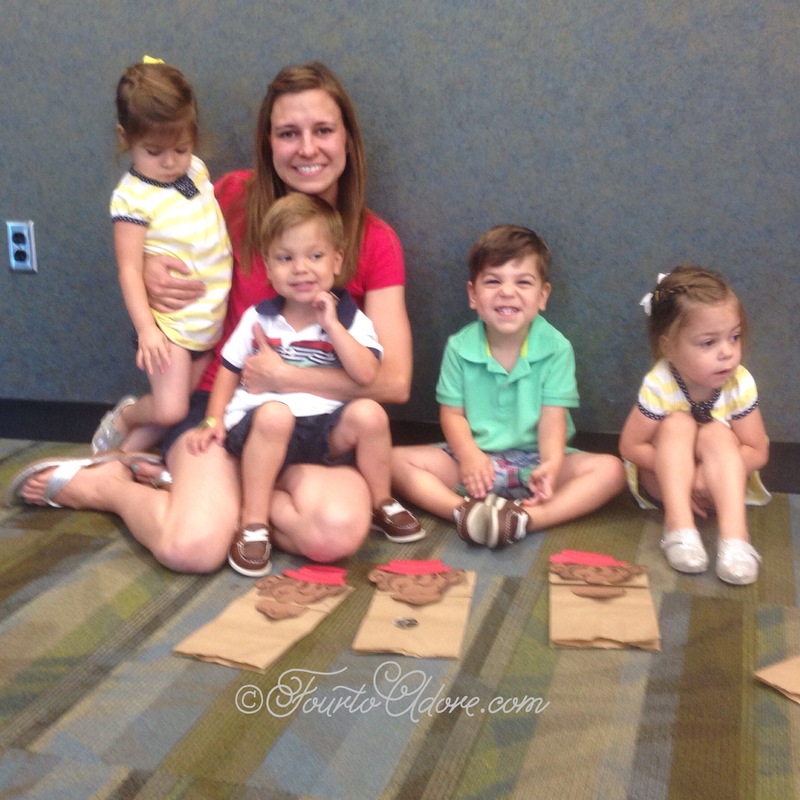 Honestly, I was overwhelmed with the notion of taking four babies out alone. Last summer as the crew approached two, I finally harnessed enough courage to take them on errands by myself. It took the encouragement of other quad moms and prep work to take this leap. Over this past year, I’ve mastered the art of cart containment at our favorite retailers: Target and Costco. Despite my willingness to run errands alone, I’ve been uneasy about field trips that would not involve containment. Our kids are typically well-behaved, especially when we’re away from home. Yet, I couldn’t help but envision the crew turning into ornery monkeys darting into harm’s way as I panicked in front of a mass of irate bystanders. At the suggestion of an Early Childhood Intervention therapist, I starting taking the kids to check the mail each day, and then on walks down our street, and eventually around the block. They understand the rules of staying on the sidewalk and staying within about 20 feet of me. Knowing the quads were willing and able to obey clear-cut boundaries outside the home helped me entertain the idea of bigger jaunts. My pal, Amber, who has quads a smidgen older than ours has been managing solo trips to the gym, library, restaurants, and such for a while. 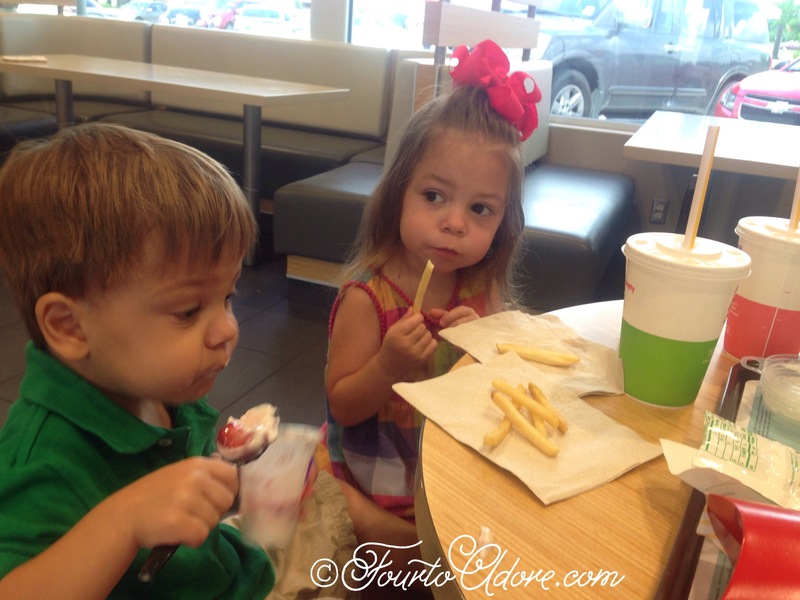 A few weeks back, I thought “I CAN DO THAT!” I started small by taking the kiddos to our neighborhood McDonald’s for an afternoon snack. Before setting out, I laid out the boundaries about staying near me and waiting in line to order food, ect. Once settled, the four noshed on fruit and yogurt parfaits and “golden” fries (as they call them) while sitting on big kid stools. 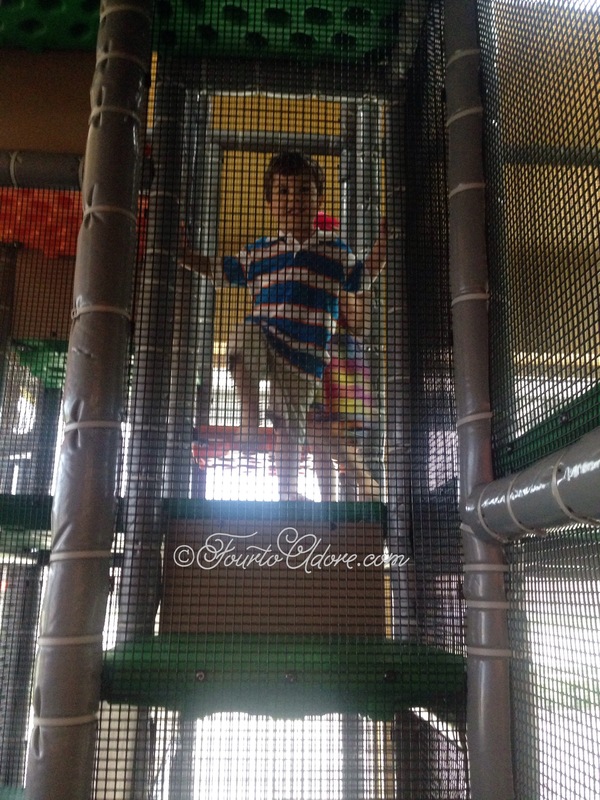 When we finished up snack, they had a blast in the play area, even climbing up to the top without my assistance. They behaved beautifully until it was time to leave. Harper and Sydney decided they were NOT coming out of the play area and forced me to climb up to retrieve them. Once I pulled both down, they decided they’d oblige me and head to the van (thankfully). Not long after our McDonald’s visit, Harper was showing unmistakable signs of an ear infection. He’d become irritable and nearly intolerable, plus he complained of not hearing. I managed to get him an appointment to see the doctor, but no one was available to watch the remaining trio. I’ve always cringed at the notion of taking three well kids to the sick side of the doctor’s office, especially alone. I envisioned them licking germs off toys and running a muck. Yet, I knew it was imperative that poor Harper see the doctor ASAP. Just like with McDonald’s, I reviewed the boundaries and set off to the pediatrician. I could not believe how smoothly the visit went, and I’m not sure the kids realized we were at the doctor’s office. Upon our arrival, they filed in behind me and obediently sat on a bench where they could watch “Nemo” and “Dori” in a large aquarium. Not one child moved until Harper’s name was called and they all lined up behind me like baby ducklings. 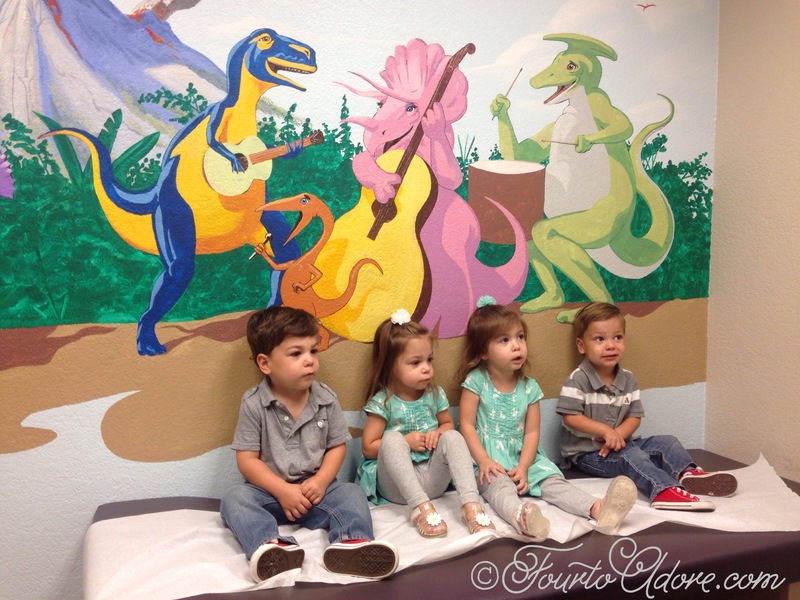 In the exam room, they agreeably sat together on the exam table while watching a kiddie flick. As expected, Harper was diagnosed with an ear infection and given a new set of prescriptions. The four were delighted to receive a sheet of stickers and prizes from a vending machine. To them, this trip was a fun adventure. For, me another solo trip win! With several successful trips under my belt, I started feeling confident about my ability to take the quads places alone. 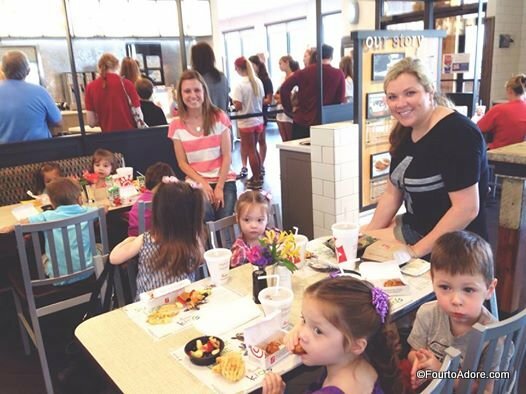 When Amber invited us to meet at Chick Fil A, I decided it was a go! Unbeknownst to us, the local schools had an early release and Chick Fil A was unusually packed. My heart fluttered when I spotted a line wrapping around the restaurant to place orders. Amber’s GPS misguided her, which meant I needed to get food for all of us. I inhaled slowly as I led my crew to the end of the line. Shockingly, they patiently waited through the winding line, and while I ordered 8 kid’s meals and two adult combo meals (that’s A LOT of Chick Fil A, by the way). Staff kindly delivered our food to the nearest open tables. 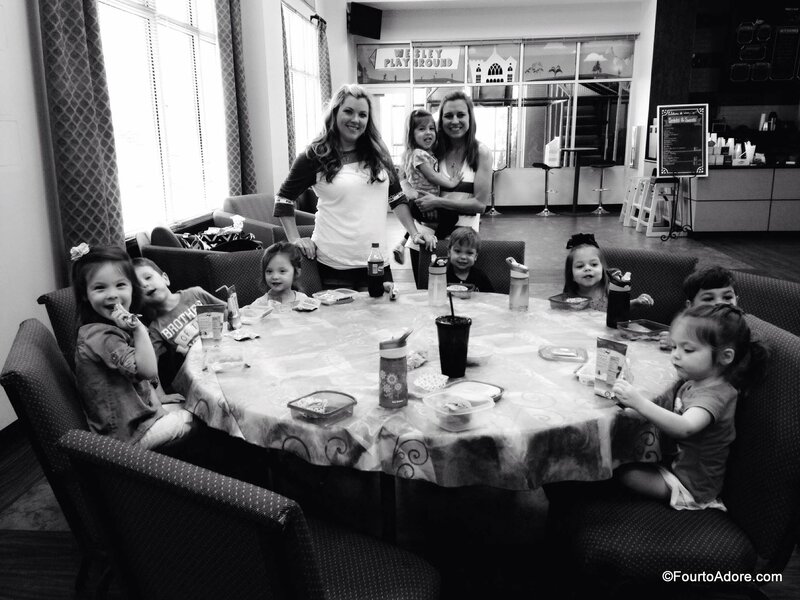 After polishing off our meals, both sets of quads ran off energy in the play area. Before parting ways, Amber and I took all EIGHT kids into one restroom stall for a potty break (another fear of mine is taking a gaggle of little kids into the public restroom). Chick Fil A has a generous sized bathroom, which made the process much easier. As we filed out of the bathroom I spotted a couple eying us trying to make sense of the scene. For some unknown reason, I muttered, “Field trip.” Upon hearing that, they grinned and nodded in understanding. After all, two teachers taking eight preschoolers on a field trip makes far more sense than two moms taking two sets of quadruplets out to lunch. 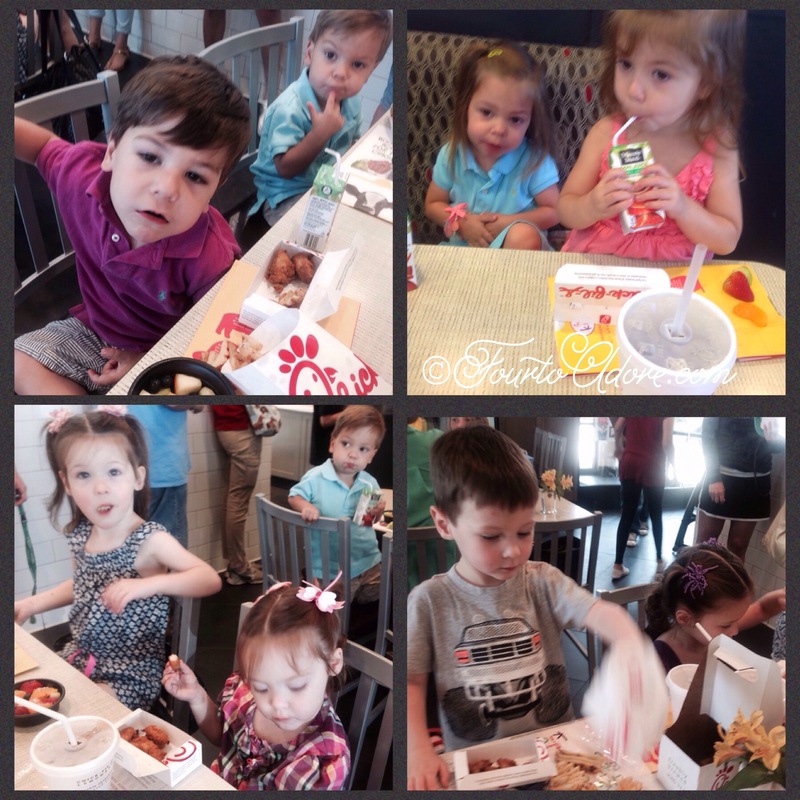 About after our successful Chick Fil A excursion, we coordinated another play date meet up. This time, at a local church play scape followed by a picnic in the cafe area. 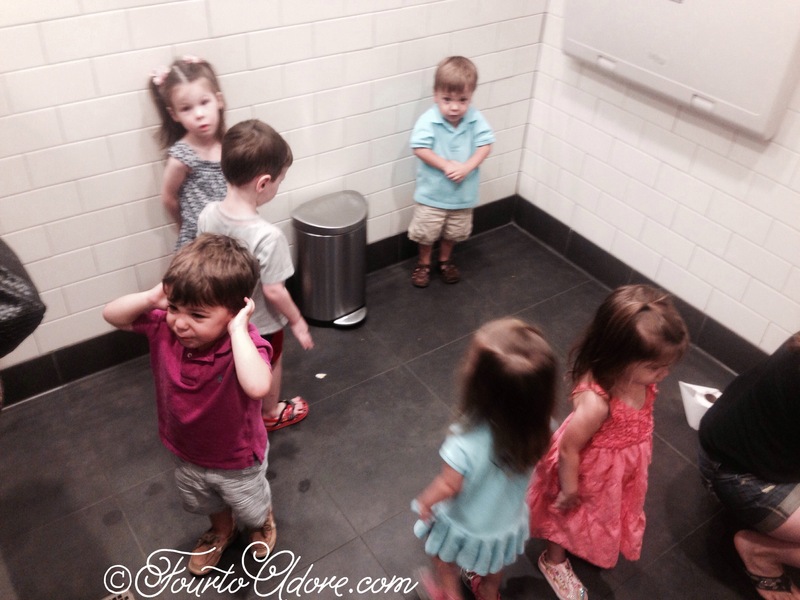 Just like at Chick Fil A, we managed a group restroom break, which included hand washing with soap and water. Feeling self-assured in my field trip skills, I thought it was time to tick off another bucket list item: a visti to the public library. 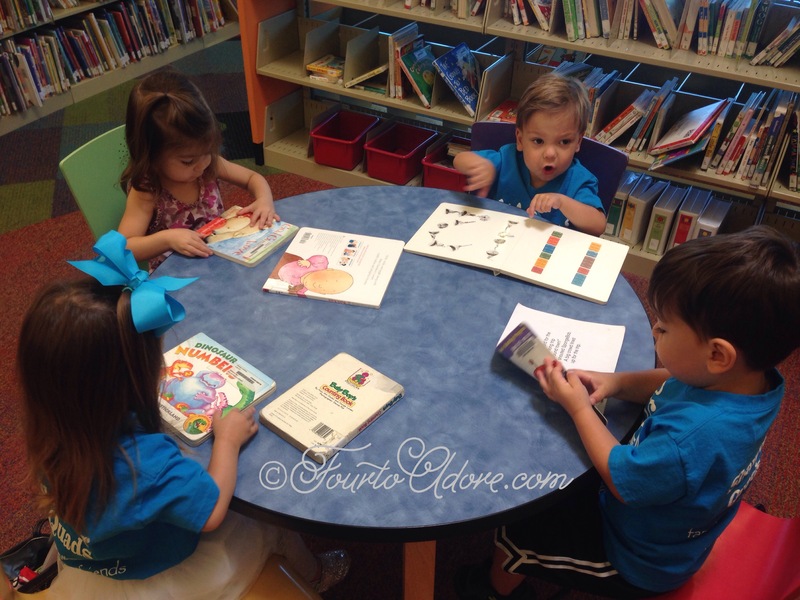 The first time we visited, the foursome enjoyed perusing board books in the children’s section. They were fascinated by the endless book choices, and having a little table to themselves. That day, each child chose one book and a movie to borrow. 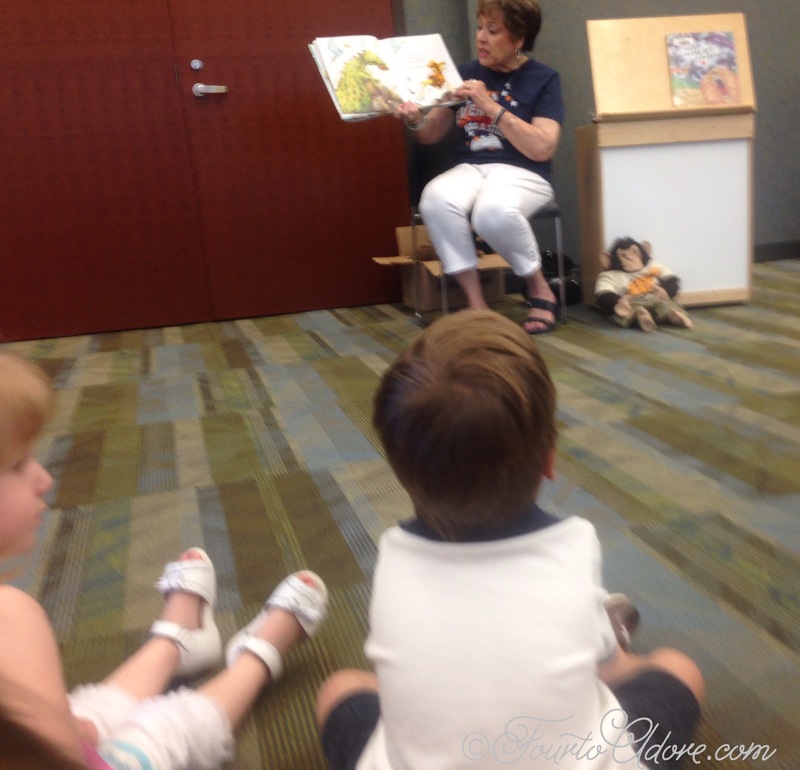 Later in the week, we met a few of our twin friends for library story time, which was a huge success. 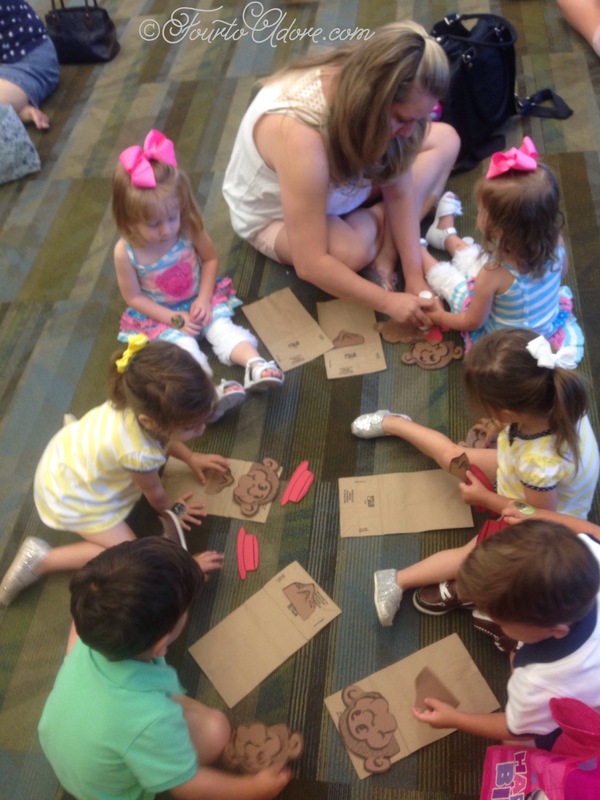 Everyone listened intently to the story, participated in songs, and completed a monkey puppet craft. I’m starting to get into a groove with taking the quads new places solo, and it’s boosting my self-confidence. I still prefer to go places I’ve previously scouted and where I can easily keep tabs on everyone, but I’m far more adventurous than before. This is awesome! You’ve opened a whole new world to entertainment! Thank you! 😀 That’s very true, every mom probably like she’s rolling the dice when taking little kids out, they can be unpredictable! Being outnumbered by your kids, whether they are multiples or multiple singletons poses extra challenges. Getting out is a ton of work, but worth it, and it’s empowering. Thank you! When we go out and the kids behave, it reminds me that the effort at home is worth it! How old are your twins? I just want to say – I love your blog. 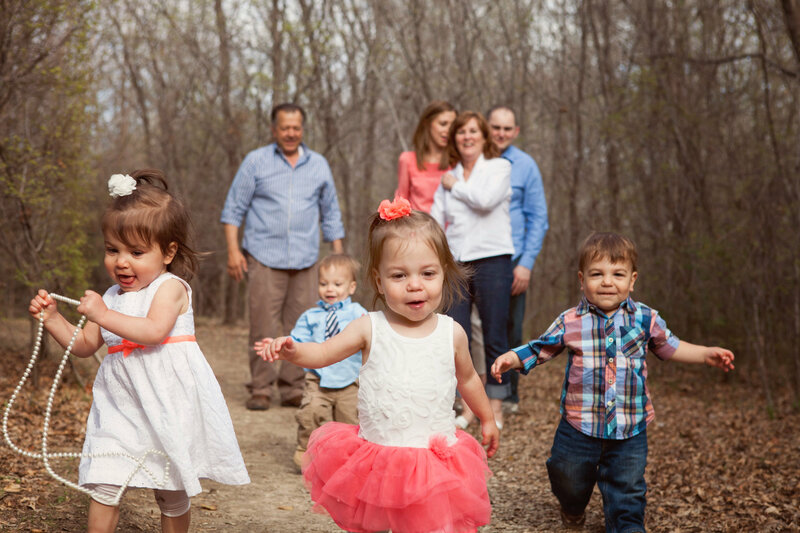 It’s inspiring for anyone with multiples – not just quads. I personally believe in having a positive attitude and I think that’s really helped me throughout the way. It makes a world of difference. I have had a great experience raising multiples and I can see that you guys Are too. I love reading your blog because you seem very positive and upbeat and face challenges head on and don’t seem to complain or shy away from difficult situations. 🙂 hugs!!! Thank you so much for your kind words! I am very positive by nature, and I agree it’s helped me tremendously- through the pregnancy and every day after. I believe the energy you put into the world is what you get in return. When things are a challenge, I figure I’ve got to make the most of it and enjoy what I can. Absolutely! 😀. I’m thinking splash pad next! I’m glad you also find it nerve racking taking four little people out in public 🙂 and, unfortunately I know it’s inevitable that 1-4 will meltdown in public, but we will all survive, right?!?! I see my daughter-in-law and sweet grand daughters in the picture at the library. As a grandmother of twins, I admire your ability to blog and share your experiences. It is a help to me and I’m sure it is to the mothers of multiples. What a challenge to raise these little ones. Your daughter in law an twin grand babies are so sweet! We really enjoy their company 🙂 thank you for stopping by our little blog!